A few years ago we published a list of the top employers specifically for the E-3 visa and at the time it was the first and as far as I can still only list of US employers who specifically employ Australians under the E-3 visa. Last we looked at the major statistics of E-3 Visa Applications and today we are going to present an updated list of employers along with some new information including average salaries, top jobs that are sponsored as well top locations that Australians work in the US under this work visa. If you are a regular reader you will know that we have done similar lists for the H-1B work visa which is open to all nationalities and given the data is far more vast because of the volume (approx 16x more issued annually) there is more reason to update that regularly. However the E-3 visa may be the single biggest reason people come to The Visa Coach given there are very few resources online and almost none of these are good except for a couple of personal experience blogs. 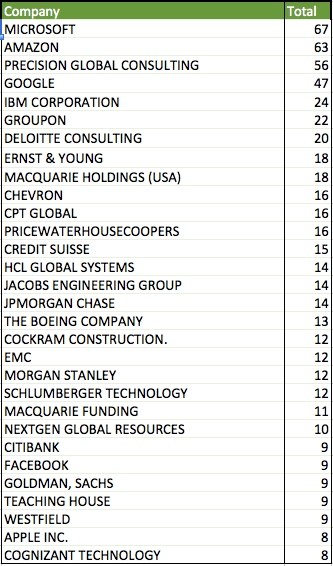 What is interesting about the above Top 30 US employers of Australians is that they only represent 13% of all the employees. In other words there is a long tail of employers that have sponsored Australians over the last 12 months, most of which just sponsored 1 person. To be exact there were 3,285 different US employers that sponsored Australians over the last year. In the above list you can obviously see a lot famous tech companies like Microsoft, Amazon, Google, Apple & Facebook along with some of the major consulting and finance brands like PWC, EY, Deloitte and Goldman Sachs. There are also a couple of well known brands to Australians like Westfield and Macquarie. In general there is a good portion of the same brands that were on the 2009 list with Microsoft still on top. However there are certainly far more technology brands in the top section than on the employer list from 5 years ago. This is a new list and largely done as a point of warning about the US Immigration system, the application process and the potential for wasted time and money, corruption and unscrupulous players. This isn’t any commentary on any of the above organizations as I know almost none of them other than Morgan Stanley who is also a Top 30 employer and one other. 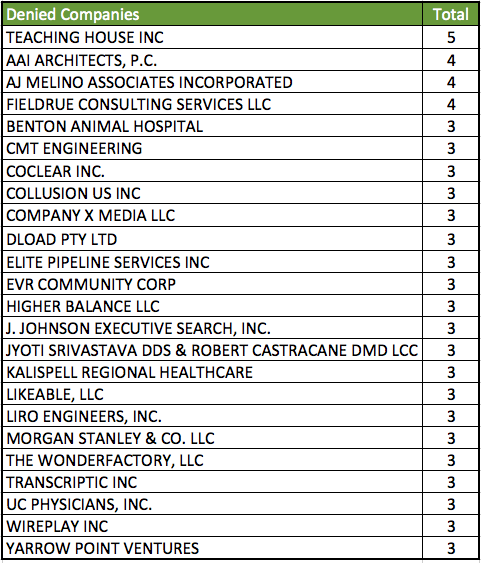 However these were the top employers who had their visa applications denied for the LCA for the E-3 visa over the past 12 months and you should be wary about anyone asking for money from you in advance to help you secure sponsorship and a US work visa. This list is probably largely no surprise to anyone based on general desires of place to live as well the population and nature of industries and companies that Australian professionals are working for in the US. In terms of hard numbers almost 30% work in New York City and about 60% are spread across the Top 12 cities listed here covering 9 different states and the District of Columbia. The 40% other proportion covers 713 different cities and towns around the US so there is broad number of places around America that Australians are working. An important point to note is note where the denials of applications are happening. In general these are proportional to the applications but not always. New York State (of which over 90% is for New York City) represents 30% of applications but 37% of all denials. In fact New York State has more denials (241) than all other states barring itself, California and Texas have approvals. 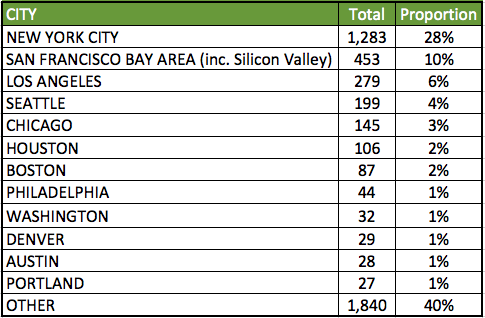 California is the next highest with 25% of all denials versus 23% of all approvals. With 60% of all denials between these 2 states it is important to realize while the desire might be the highest to move here it also the most competitive for foreigners in general as well as Australians and thus also most prone to non-professional or worse behavior. The nature of specifying a job on your ETA-9035(e) application to get your approved Labor Condition Application (LCA) for your E-3 visa is largely based on the way the prevailing wage works and the official sources of information where you can lookup this information. This is why these job titles look funny and broad in nature and may actually differ from the company job title you have that would be on a business card. These categories in total comprise 54% of the total of all job roles on the E-3 visa over the past 12 months and the remaining 46% cover over 250 other job roles. 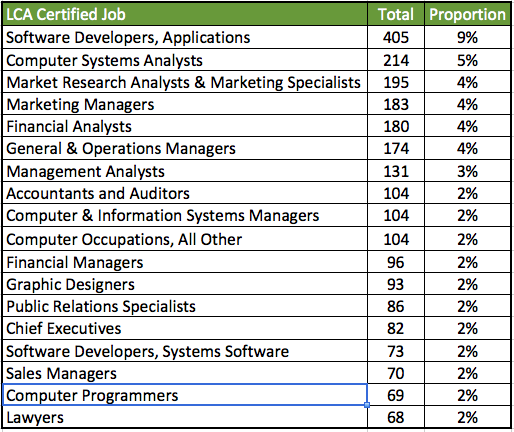 In general IT Developers, Marketing, Senior Management and Finance roles dominate which correspond strongly with the companies that are top employers. 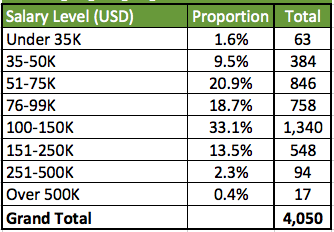 For the approved applications over the past 12 months for the E-3 visa this was the annual salary level on the application paid to Australians. As you can see 63% of the salaries are between $50,000 USD and $150,000 USD and about 15% of the salaries are greater than $150,000. Interestingly a couple of the very low salaries were as low as $17,000 USD and looking at the individual cases they were for farming type jobs in Georgia which would be seen to breach the bachelor’s degree, specialty occupation and prevailing wage conditions. I would guess in most cases these would be denied and may have been denied once they went for the US Consulate interview. The highest salary was one person and was $1.25M USD. It is a source of confusion for many foreigners when they realize that there is actually a minimum wage that they must be paid to be sponsored on an H-1B Visa, E-3 Visa or O-1 Visa that is not related to general US minimum wage law. This is known as the Prevailing Wage and it differs by profession, level, geography and nature of the role. When an employer files the ETA-9035(e) form to the Department of Labor (DOL) to get your approved Labor Condition Application (LCA), a part of that form relates to inputting the Prevailing Wage from a verified source. This is the only step required in a standard E-3 visa application prior to an applicant going to their US Consulate interview if outside the country but it is the preceding step to filing the I-129 form to the USCIS which is mandatory for H-1B visa, the O-1 Visa and for the E-3 Visa if the applicant is already present in the US under an approved status. The actual Prevailing Wage can be slightly subjective but the important thing to note is that it is never a very low amount and the LCA can be rejected if the DOL determines it is not the appropriate job code and pay level given your role. Many foreigners fall at this step in their eagerness to get to the US they are willing to be paid a lot less for the chance not realizing this is part of the process. The are a few government approved sources but the most common is the FLC Data Center. They have a wizard where you can enter your location and job type and you can manually find which job code is most suitable relative to the role you are going to fill and the Level from I to IV which largely corresponds to seniority. It is here with job codes and similar job types and the seniority that people get creative with what job code is suitable to match their pay level. However you want to be careful as if you are a professional leading a team and you just put down a Level I, Entry Level Job code for your job type, you could be rejected and face additional scrutiny for any future application. As mentioned these job rates relate to professional jobs so the rates are far higher than any minimum wage level for the state. Also it is worthwhile noting there will be significant differences for the same role depending on your location. A Business Analyst working for Ernst & Young for example in NYC will have to be paid more than if they were working in Seattle at the minimum allowed level. Ultimately you should negotiate the best wage, benefits, bonus, equity and severance package policy at the beginning and this minimum level should never be an issue.